ETX Capital has been operating under that name since 2008, but its roots go much further back. ETX Capital is in fact is the trading name for Monecor (London) Ltd., which was incorporated in 1973. For a spell in the 21st century it was known as TradIndex, but when the group was acquired in 2007 the name was changed from TradIndex to ETX Capital as part of a relaunch. It is said that the letters ETX reflect the business, as they stand for Electronic trading, Telephone trading, and eXecution services. TradIndex (now ETX Capital) was launched in 2002 by Tradition Financial Services (TFS), one of Europe’s largest brokerages. TFS, founded in 1985 firms is part of Compagnie Financière (CFT) which is in the world’s top three brokers in OTC financial (money markets, bond markets, interest rate, currency and credit derivatives, equity derivatives, exchange-traded products) and non-financial products (energy, precious metals, pulp and paper, etc. ), and number one in continental Europe. CFT shares have been listed on the Swiss Stock Exchange since 1973. A relative newcomer to the industry, ETX has developed a small and loyal client base who like the intimacy and good customer service that being with a smaller operator brings. Unusually, the minimum spread bet is as low as 50p per point. Other brokers usually start at £1 per point. There is no minimum deposit to open an account, but they recommend at least £100. Since the relaunch, the company has been growing dynamically, and there’s emphasis on customer service and friendly staff. It welcomes trading on the telephone as well as on the web. In common with many other brokers, given the increasing interest in spread betting in recent years, ETX Capital places an emphasis on education. It runs free weekly seminars in its Central London offices for both potential and existing clients and for those who cannot attend physically there are free weekly webinars via the Internet. In addition to this, ETX has arranged with a training company for access to their comprehensive training free of charge. Views from the floor – Market Strategist Ishaq Siddiqi whose previous experience includes writing for Dow Jones and the Wall Street Journal and Markus Huber, who’s career spans over 20 years in the financial markets, now posts commentary throughout the day from the opening bell to close, keeping you updated with the latest market action. Weekly blog – ETX has picked the most experienced team of traders to share their market views with you headed by Market Strategist Ishaq Siddiqi. The team posts weekly for their take on the markets, the global economy and what to expect in the week ahead. Daily market bite – your morning video update with Ishaq Siddiqi for a snapshot of what’s happening in the markets and what to expect over the course of the day. Meet the team – find out more about ETX’s traders and contributors and their experience in the markets. The trading platform is relatively new, and offers spread betting and contracts for difference (CFDs) on major indices, shares, commodities, currencies, and options. It has advanced charting features built in, and the spreads are claimed to be tight. They vary from one pip on indices, two pips on Forex, up to about four pips. The platform offers one click dealing and 24 hour trading. The platform is browser-based, and as with many others requires Flash and Java for full operation, which are free and it is likely your PC already has. ETX is generally fine for execution in terms of speed and lack of rejections, although do check for slippage (which isn’t obvious unless you check carefully). They have also recently introduced trailing stops and standard stop limit orders are also available. You also will not find any guaranteed stop orders with this broker, which as we do not use them generally is not a big concern to us, but may matter to you. Against this, you have the advantage of free professional charting which includes 70 technical indicators and the ability to build your own indicators. There is also a back testing module built into the platform. What’s their pitch? : ETX Capital provides institutional, high net-worth and retail customers with multi-asset dealing capability through contracts for difference and financial spread betting products. It seeks to offer high levels of customer support and guarantees total client confidentiality. ETX offers spreads from just 1 point and margins from 1%. – ETX Binary; A new exciting platform for fast trading and fast returns! 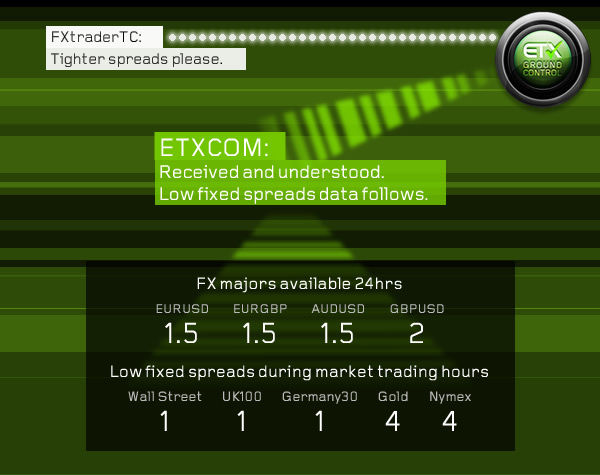 – ETX Trader; A new user friendly platform to help beginners get started and manage their risk. – ETX TraderPro; All the features a serious trader needs with advanced charting and fast execution. – ETX MT4; Trade on the world renowned MT4 platform using Expert Advisors (EAs) and technical analysis. Here’s what they say about why we should choose them! Powerful fully customisable platform with fast execution and one click dealing. Multiple mobile apps: iPhone, iPad and Android. Now offering the popular MetaTrader4 (MT4) platform. Wide market range with over 7,000 global instruments all tradeable from one single account. Tight fixed spreads on popular markets with major indices from 1 point, plus new variable spreads available on major FX pairs. Trade EURUSD from 0.7 pips. GBPUSD and AUDUSD now from 0.9 pips. Low trading costs – our minimum trade size is from just 50p per point. Plus low commissions and low margin requirements. £500 worth of free education – choose from our extensive range of webinars and seminars. Whatever your trading level we have a course for you. Extras: ETX Capital provide lots of free market tools to their clients to help equip them with the knowledge required to become successful traders. Trade-through charts were designed by traders for traders and recently were awarded Best Charts at the Money AM awards 2012. Real-time newsfeeds, morning bulletins, market news directly from the trading floor, and newsletters emailed each morning for free are all part of the ETX Capital service as standard. We give ETX Capital a Rating of: 4 for range of markets, margins, spread sizes and general client satisfaction (ratings are from 1 to 5 with 5 being highest). The bonus that ETX Capital is offering to new clients is up to £500. When you open your account they will put £50 without you even having to deposit anything. Then they’ll give you 50% back of the total stake from your trades up to the value of £450. The offer seems fairly generous! As if this wasn’t enough ETX also provides £500 in free advanced trading education. Overall we like ETX Capital for their modern and energetic outlook, although pretty standard platform. Their spreads are average, but their execution is great and you can trade micro lots – their customer service people are also quite good. We rate them as worth a look given their clearly laid out, easy-to-use and straightforward spread betting service offering access to major global markets – and of course their generous superb opening offer.